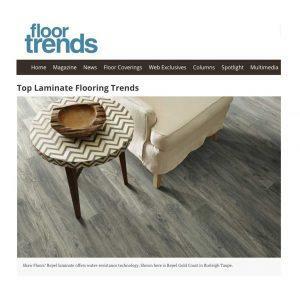 Great article published in Floor Trends magazine about Tarkett’s innovative flooring. In the article, Tarkett’s Vice-President of hard surfaces explains that the company has been seeing a demand for quickly changing visuals and constant advances in technologies. As further explained by Katie Szabo, Tarkett’s product manager, some of this demand is coming from a shift in customer thinking in regard to health and wellness. In response to this demand, Tarkett submitted some of their laminate products for testing to our standards and the products that passed our scientific standards have joined our asthma & allergy friendly® Certification Program. Tarkett offers laminate flooring certified asthma and allergy friendly by the Asthma & Allergy Foundation of America. In order for flooring to meet the standards, the flooring must be easily cleaned, and as a result of cleaning, reduce allergens; as a result of cleaning, airborne allergens levels must remain low; and volatile organic compounds (VOCs) must remain below safe levels after installation.